Maybe BTD is admitting that he himself isn’t a reporter? I don’t have any conclusive idea about the answer to the real question of Wikileaks – who leaked? I think we can easily conclude that a 3rd year private in a hovel in Afghanistan (Manning) would not have access to 250K+ State dept documents from embassies across the world. So, who did have access? Second, why? There was nothing (so far) in the documents that permanently destabilized our diplomatic relations, a lot of embarrassments that cause the Villagers to titter into their sleeves – but nothing earth shaking. So … why? Please, I’m not trying to tell you what to write about, I’m just wishing we could get some of this blogger energy directed to the real mystery behind this situation. Thanks myiq2xu, for everything you do. I don’t think we can totally separate Assange from WikiLeaks. OTOH, he is not the only factor we should consider in evaluating the information being leaked. 2. Who leaked it to WikiLeaks and why they leaked it. 3. What information may have been withheld and why it wasn’t leaked. 4. The motives of Assange/WikiLeaks in releasing it. 5. What information may have been withheld by Assange/WikiLeaks and why it wasn’t released. Evaluations of Assange’s character help us evaluate his motives and credibility. BTD — biting the hand that feeds him! Whodathunkit? The difference between a therapist and a judge is that one of them wants to know the truth and one of them wants to know the goddamn facts. Journalists should want the latter, but they’ve gotten caught up in the former and the power that carries to be king-makers. There is nothing wrong with being an advocate but if you’re gonna be one don’t pretend to be neutral and objective. Remember Donna Brazile? I don’t know whether to laugh or cry. I think I’ll do both while cackling hysterically in my bitter, deadender, kind of way. Yeah, pretty much proves BTD only values the media when they agree with him. I always knew he liked Obama because of his anatomy, and latched onto his “media darling” status as camouflage. Inconsistency is an immutable characteristic of all Obots. He supports women if they happen to meet his other criteria. BTD sports a very big chip on his shoulder. Just roll your eyes and consider the source. It was the reason BTD could remember to use no matter what came up against Obama. If he told the real truth behind his favoring the Big O, he would have to deal with the consequences. There’s a pattern to BTD’s choices, and he slips now and then with where his prejudice falls. He doesn’t post much these days. JM has turned TL into such a piece of trash that BTD can’t get a good discussion going with those who are left over there. And considering the state of modern, American journalism, our journalists are probably getting trained in a way similar to how cops get trained to get people to waive their Constitutional rights. Lex probably learned to distrust cops on the mean streets of Santa Monica or Long Island. If he’s ever been in a ghetto or barrio he was lost. Do they have gang bangers in Negaunee Township? You need to move to a lawless land or island with all the other anarchists. There are some small islands in Hawaii that are uninhabited by humans. No cops or rules at all. Might be what you’re looking for. Maybe we could build one wifi tower for you so you could still do internet. ..but it strains credulity to believe that a reporter who has concluded that Assange and Wikileaks “aren’t acting in good faith” can present itself as, in the words of Newsweek, “objective and nonpartisan. All BTD is saying here is that he’s on Team Julian. 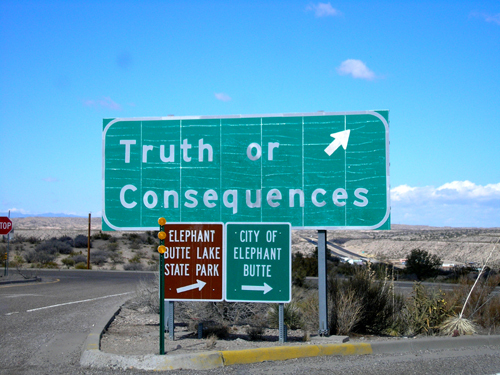 truth of the matter is that many in Truth or Consequences (T or C), New Mexico want to change the name back to Hot Springs….so much for truth or consequences…. What a crazy friggin game at the Sugar Bowl. But my Buckeyes win!! !